Mid-fall to winter is usually when the Lower Yuba will fish at its best. 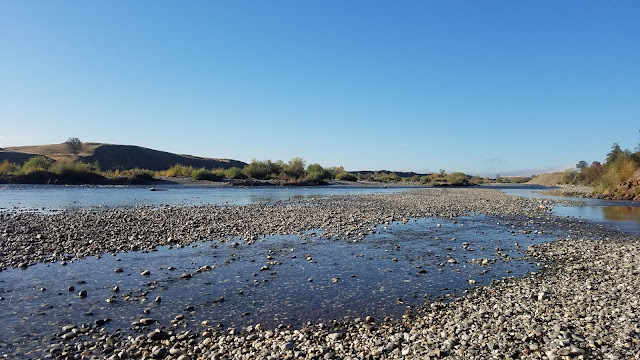 The river is still rebuilding itself from last year's calamity flows so the fishing could either be a hit or a miss. Curious about what's out there I took some time in the morning before work to see what I could find. 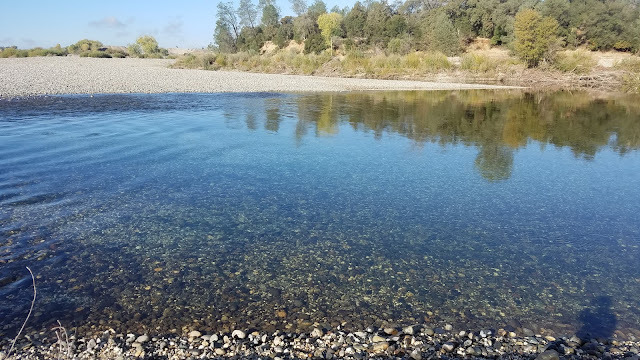 The flows on the Lower Yuba are at a stable and gin clear 1,000CFS. I started the morning at Hammon Grove and fished the riffle with a nymph rig. Just like the rest of the river this section was flatten out with little to no pockets for fish to hold in. I fished both sides of the riffle and couldn't get a single nibble. The tailout above Hammon Grove riffle typically has a few salmon spawning in it but I didn't find a single fish nor any signs of salmon in the area. The next spot I explored was the Aquarium. If there were going to be salmon anywhere in the river it would be at the Aquarium. As I hiked towards the rivers edge I stopped at the bluff overlooking the Aquarium and was surprised to find it completely empty. If this is any indication on river's health then it's going to be awhile before it starts getting any better. I fished around Miner's Corner and despite how fishy the deep slots and runs looked I couldn't interest any fish. I'm going to leave the Yuba alone for the rest of the year so that mother nature can do its thing. I'm sure that if you were to float the river and cover more water you'd have a better chance to catch a few but that's pretty typical. There were a few good signs I observed such as risers in the flats, stub-wing stonefly shucks on the banks, and aquatic insects hitching a ride on my waders. Here's to hoping that the winter storms this year carve out some better slots in the river. Thanks for the info. I might head there once Putah "closes" for the season. Dry fly fishing has been OK on the Yuba recently if you can time it right. I had a pretty good day out there around the time of your report, with a blizzard pinky hatch. Of course, all the fish were small. I agree, the river needs to heal. Hoping for good rains, but stable flows, this year.